New Malden’s high street is bustling. Consumers are darting in and out of shops, whilst kids wander around making the most of the summer holidays. Most people are trying to avoid eye contact with the group of clip-board carrying charity workers. It’s just another busy shopping day. Up near the railway station, raised up high on a bridge, things are a little calmer as passengers dart inside to escape the sunshine and hide in the shade of the station entrance. Trains thunder overhead. Services to Waterloo, Woking and Wimbledon. My destination is slightly different. It’s the greatest river the United Kingdom has. The mighty River Thames. And I’m going to get there by following another great water source. The Beverley Brook. It pops out from under the round, a couple of meters wide but only a few centimetres deep. Where it’s come from; what it has experienced to get here. Ah well, that we will not know. But here it is. And it’s time to follow. Most of the capital’s tributaries to the Thames have long been buried underground, but a handful remain to be seen on the surface. The Wandle is perhaps the best known, but there’s also the Brent, the Crane and Beverley Brook. At just over 14km long, Beverley Brook surfaces in Worcester Park in the borough of Sutton and weaves its way gently through Motspur Park, New Malden, Wimbledon Common, Richmond Park and Barnes before joining the Thames near Putney Bridge. For its final 6½miles it is followed by the Beverley Brook Walk, a footpath which roughly follows the river as it flows through the south of London. Beverley Brook doesn’t go near New Malden station; the Walk starts there purely due to the availability of public transport and leads the walker along quiet housing estates lined with expensive looking mock Tudor houses until coming alongside a golf course and heading down in a subway under the A3. But on the other side there’s a little treat for the walker: the first glimpse of the waterway they’ll be following. The Brook’s dalliance with running near housing is short-lived and quickly we’re on a more greener landscape, walking along the side of a number of rugby pitches, lined with fruit. Damsons and redcurrants are in attendance, as are a number of apple trees where fruit’s growing. Pick some along with the nearby and totally ubiquitous blackberry and you’ll have yourself a crumble in the making. At the end of the fields the path enters into the woods of Berveley Meads and Fishponds Nature Reserve and whilst my leaflet, downloaded from Merton Council’s website, tells me I may see kingfishers and mandarin ducks I just see joggers, dog walkers and a man riding a horse. The name of the river itself comes from the European Beaver but I won’t be seeing them on my trip either. They became extinct in the 16th century. 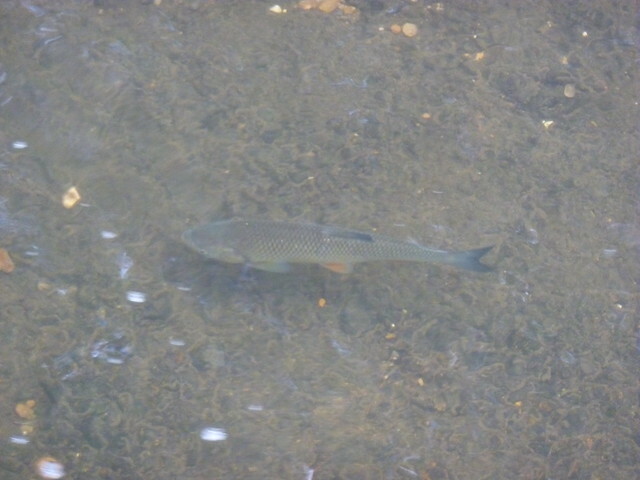 Scores of small fish swim happily, fighting the exceptionally weak current. 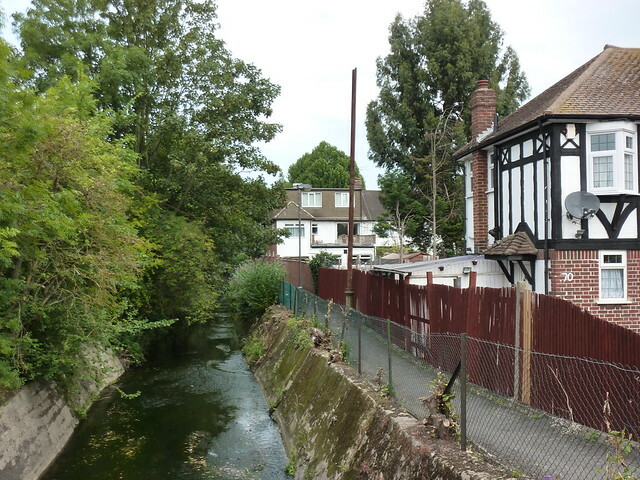 Once the Brook was so polluted thanks to discharge from a sewage works, that it was essentially dead. But now it’s alive and happy once more. Sticklebacks, roach and chubb can be found in its waters. The brook’s barely flowing but it does manage to get into Wimbledon Common, running along the edge of the common with the noise of the A3 rattling around in the mix. Still it won’t be around forever. The Beverley Brook Walk is one of those rare oddities – the closer it gets to busy urban centres, the quieter and more isolated it seems to get. A peaceful oasis in a mad urban jungle. A large set of traffic lights is the first sign of this as a set of crossings lead riders, cyclists and walkers into Richmond Park. 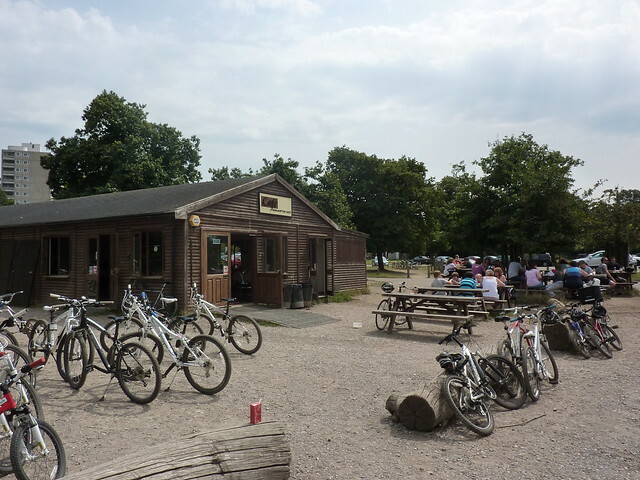 Owned by royalty, Richmond Park is a Site of Special Scientific Interest and a National Nature Reserve and boasts plenty of deer although on this warm and muggy day the park is fuller with kids frolicking in the sun, enjoying their time out of school. The Brook flows through the park from near Robin Hood’s Gate. Entering via a small channel it cuts along the right side of park, providing a handy boundary between the park and the adjacent golf course. Although the large fence probably does a better job. Richmond Park’s always a delightful place to visit. The hustle and bustle of nearby city living just seems to melt away with only the odd tower block and low flying aircraft descending to land at Heathrow reminding you that London is not far away. It’s a wrench to finally leave the park but as it’s lunchtime I pop into the cafe at Roehampton Gate where there seem to be about ten members of staff but only two of them actually doing anything. People are after sausage baguettes, ice creams and coffee all at the same time, and the guy on the till seems to be struggling to maintain order. “Can you keep an eye on those paninis?” he asks a colleague only for her to wander off to the kitchen, reappearing a few minutes later looking slightly dazed; as if she doesn’t really know what she’s doing there. Meanwhile there’s another woman stood like a statue next to the ice cream counter whilst the man on the till darts over to put a scoop of “cookies and cream” on a cone. Outside the park three people are standing in the river as their dogs splash around. Quite how they got there, I couldn’t work out. Beverley Brook is hidden away behind a fence; inaccessible to all. Or so it appears. So how did they get there? One of them looks vaguely confused as his dog splashes around happily. Perhaps he can’t work it out either. Then at Upper Richmond Road the path and the Brook depart for a while. As the waterway sailed off happily down between the rather expensive looking houses of Barnes, I was left to wander down streets. The Walk took a slight detour down the impressively named but rather bland looking Priests Bridge just so I could take a quick glimpse, but that was it. Even the bridge didn’t reveal why it was called what it was; a metal plaque fixed to one side just revealing that anyone posting bills on it would be prosecuted, signed by order in the turn of the 20th century. Down Vine Road I went, approaching a level crossing. Well two level crossings with a short patch of road in between allowing four sets of tracks to cross this quiet road. As I approached the inevitable siren began to blast out and the large metal barriers gently came down. Trapped in no-mans land on the other side, a woman with a buggy joined me in the waiting game. Some cars pulled out. Another buggy arrived. The train didn’t. Then, finally, a few minutes later three trains zoomed past. 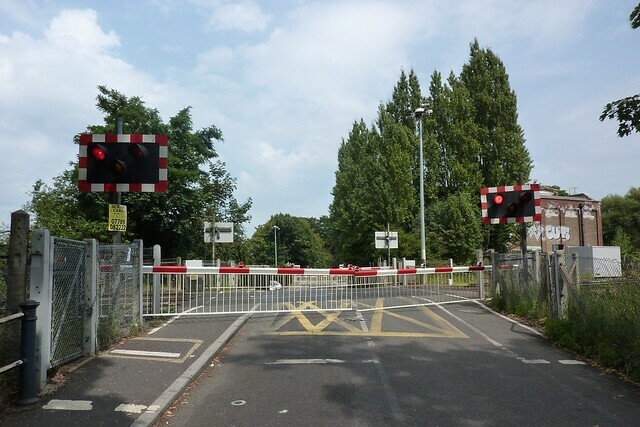 The second set of barriers on the other side opened, but the ones closest to me remained firmly shut for a bit longer until a fourth train pulled out of nearby Barnes station and headed off. We were free. I headed on over the crossing, passed the old boarded up signal box and on my way. As I got to the other side, the barriers began to come down once more. Barnes Common, Barnes Green, whatever. More grass, less Brook. It flowed on through the edge of the park, accessible only by scrambling through a patch of nettles. On the other side, the Wetlands Centre and some more houses, but the birds of the world wouldn’t be getting much of a dunking from the Beverley. Rather than getting swollen and fat as it went along, it seemed to have lost most of its water through its now muddy floor. Then there’s an odd sight. 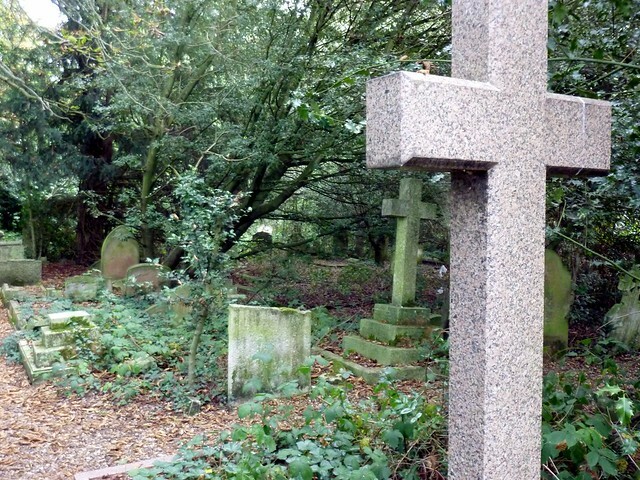 Having closed in the 1950s, Old Barnes Cemetery is now overgrown and unloved. Brambles and weeds choke the old memorials and statues. “Forever in our minds” proclaims one headstone. Not any more. I wander around the rows of memorials, now surrounded by so much greenery that it’s like you’ve discovered a long abandoned city rather than being just minutes away from a bustling main road. In Lower Putney Common the Environment Agency had erected a large fence and put in place a diversion. A sign told the walker (well me) that the Beverley Brook was a major worry on flooding which seemed quite remarkable given how little water it held. 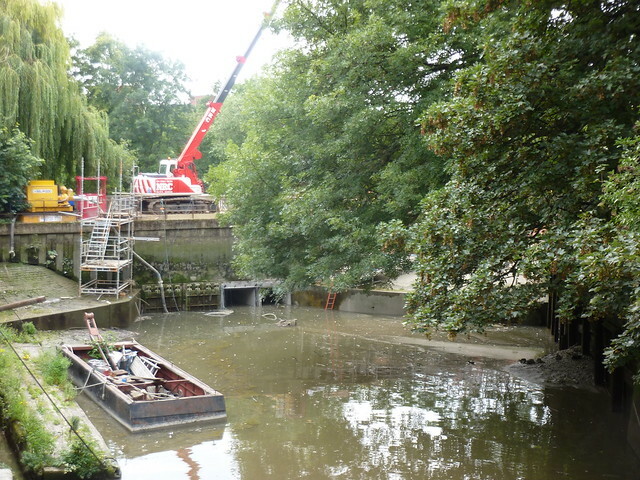 They were upgrading a weir that allowed the Brook to flow into the Thames as it was in bad repair. An eel and fish gate would be added whilst they were at it. They were sorry for the inconvenience. Following the aisle of metal barriers I arrived at the Thames a mile or so from Putney Bridge and a few hundred metres upstream of the old Bevster and I wander back towards the gap where the Beverley Brook added its tiny amount of water to it’s larger neighbour. Not that it was adding anything today. The weir gates were firmly shut; a crane sitting atop of them. The Beverley Brook’s journey had come to an end, but its final act would be denied. It’s role as Thames tributary unfulfilled. Soon it will be able to rejoin the party as it heads for the sea. But until then the Beverley Brook will just have to wait. Despite the walk being produced in partnership with, amongst others, four different borough councils, you won’t find much about the Beverley Brook walk. Richmond Council will tell you it exists, but nothing else. Kingston mention it in a map (pdf) of Richmond Park, but won’t tell you where it goes. Meanwhile in Wansdworth, they’ll just tell you about the flood defence works. The Ramblers Association will at least tell you where to get a leaflet. It’s left to Merton Council to actually care enough to tell people what the walk is and where it goes via dedicated pages on their website. Thanks, Andrew. An enjoyable stroll in an area I once knew well, many years ago.